This charming B&B, surrounded by prestigious shops and restaurants, is located in the centre of Valencia; the old town, the Barrio del Carmen and the Cathedral are just some meters away. 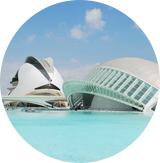 It is also well connected to the beach and the City of Arts and Sciences. All rooms at the B&B Hi Valencia Boutique feature cozy décor, heating appliances, air conditioning, Wi-Fi and TV. Take a look at our selection of pictures and discover our rooms and facilities. Download for free our app Hi Valencia and you can get to know tourist information, tourist attractions, weather forecast and much more.